The apartment is centrally located, in Hamburg-Eimsbüttel near the Schanzenviertel. There are many bars, discos and restaurants and yet the apartment is located in a quiet and safe street with park views. Free parking is available in the street. 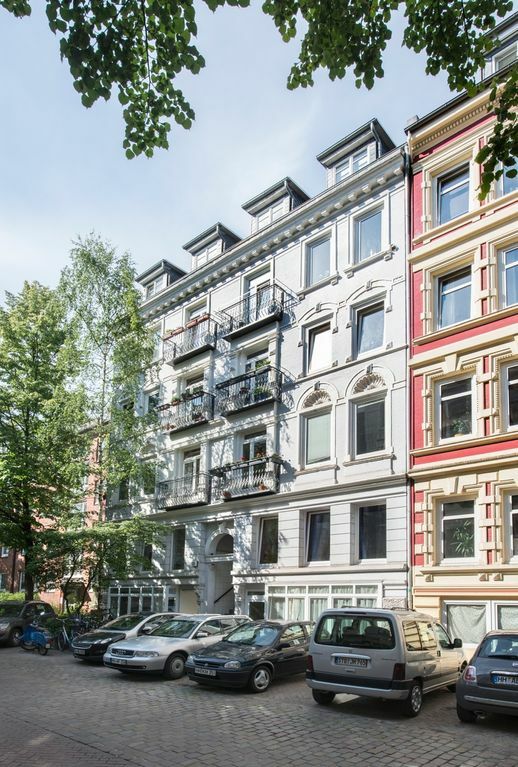 The apartment is located on the ground floor of the beautiful Mehrparteien-Jugenstil house right on the Linden Park. It is friendly and modern. The apartment has a large wooden terrace, a beautiful garden with direct park access, fireplace, two bathrooms, two toilets, a projector with screen incl. Amazon Prime TV (= see many movies for free) and DVD Player. In the 110 sqm apartment you expect 2 each 14 sqm large bedrooms, each with a large double bed (1.60 * 2.20) and an 8 sqm bedroom with a small sleeping coach for 2 children (1.40 * 2.00) in addition offers the large loft space (living room = 44sqm) is still a place to sleep on a comfortable sofa bed (140 * 200) - so fit 6 adults and 2 children well into the apartment. The entire 30 square meter basement floor is equipped with underfloor heating, in which 2 absolutely quiet bedrooms and the newly built spa in the year are housed. Another shower room is located on the ground floor. The bathroom has a beautiful whirlpool tub, a glass-cabine shower and the natural stone vanity invite you to relax after the shopping hunt. The 2016 built-in sauna also contributes to relaxation. Through a light shaft you get in the two bedrooms below through two windows daylight - but not sun-drenched. 2 luxury bathrooms (2016/2019) with underfloor heating, natural stone floor, modern round shower, natural stone vanity + sauna There are two separate shower rooms / with two toilets in the apartment. Free public parking is available in the living calmed road game. However, the area is very popular and the evenings and on weekends parking is scarce. You can reach all tourist destinations by foot or by train, bus and (city) bike quickly. Further equipment: Baby bed / playpen incl. New mattress for babies up to 15 KG by Hauck (model travel bed Dream'n Play SQ 96x96x cm circus) All stretch cans are child-proof. Lovely apartment, close to public transit, neighborhood shops, bars and restaurants. We loved this place! The apartment is very cool and our hosts were very welcoming; making sure we were taken care of on our trip. We only stayed 3 days in Germany, but staying in this apartment was the perfect way to spend our time when not exploring. I enjoyed the Sauna - this was especially perfect after long days wandering the city. The train station was maybe 2 blocks away - so it made getting back to the apartment very easy. The private garden area was the perfect spot to spend the mornings getting ready for the day. We had 6 people in our group and this place accommodated our needs very well. The only thing that was a little difficult was the front door lock - it was a bit tricky and took some time to get use to. Overall - great place - loved it! Tx for your Feedback. Yes, this apartment is in the middle of the center for fun and relaxing. We enjoyed the painting of your kids in our guestbook very, very much. She is a great painter and must become a comic-painter!!! If the detais of this appartment fit your wishes, don't look further, but quickly make your reservation. This is a nice looking appartement, absolutely clean and comfortable and a very good place from which you can explore Hamburg easily. Public transportation is very closeby. You need to walk appr. 5 minutes. For a well assorted supermarket, you need to walk only 3 minutes. The description is very good. I want to add the fact that the kitchen is very complete. The owners supplied everything you need for making your own dinners. The owners are very friendly and they made a good effort in making the place comfortable for their guests. Die super ausgestattete, sehr saubere und liebevoll eingerichtete Ferienwohnung hat uns sehr sehr gut gefallen. Sie liegt zentral (kurzer Fußweg zur nächsten U-Bahnstation) aber dennoch ruhig. Kneipen, Restaurants und Geschäfte sind in unmittelbarer Nähe vorhanden. Besonders gut hat uns der schöne kleine Garten gefallen, den man in einer Großstadt gar nicht erwartet. Die Wohnung ist perfekt geeignet für ein Familientreffen mit Kindern. Wir kommen gerne wieder. Nearby you will find university, fair, Congress Centrum, the colorful Schanzenviertel with countless restaurants, pubs, cafes, the famous Reeperbahn, three times a year the 'Hamburger Dom' with attractive rides and culinary specialties. 'Planten and Blomen', an extensive theme park can be reached as quickly as the city center and the beautiful Alster. English: The apartment is centrally located in Hamburg's most popular district - Schanzenviertel - close to city center, fair, harbor - and yet in a quiet street with a park view. Underground station Christuskirche and subway station Sternschanze are situated in 10 minutes walk and run directly to Hamburg Trade Fair, Hamburg Central Station and the Reeperbahn. Because of the proximity to the University, Exhibition Hall and Congress Center it's interesting for business people, who prefer a rather unique atmosphere of home away apartment to a hotel. Der Preis bezieht sich auf eine Belegung von 2 Personen pro Tag. Für jeder weiteren Erwachsenen ab 12 Jahren berechnen wir 20 (Nebensaison) bzw. 25 Euro (Hauptsaison) pro Nacht Extra. Kinder unter 6 Jahren übernachten kostenfrei. Bitte geben Sie deshalb das Alter der Kinder bei Ihrer Anfrage an, das diese bei Aufenthalt haben werden! Für die Endreinigung berechnen wir einmalig 90 Euro (darin enthalten sind Bettwäsche sowie Handtücher-Leihgebühr) Für Anmietung an Wochenenden (Fr, Sa, So) berechnen wir einen Aufschlag von 10 Euro pro Tag.